I have been traveling to the Philippines for several years and I have grown to really like the place but most importantly, its people. In November 2010 I have finally taken the plunge and moved here — not without apprehensions and reservations. The move was easier than I expected but certainly not without its snags and snafus. I grew up (I think) in Europe and spent the first 20 years of my life there. The next 40 years (essentially my productive span) were invested in the United States (mainly in California (both Southern and Northern) with stints in Colorado (Fort Collins), Washington (both state and D.C.), Idaho, and Montana. The last however many years I have I want to live in Asia — it has a nice balance and symmetry to it. 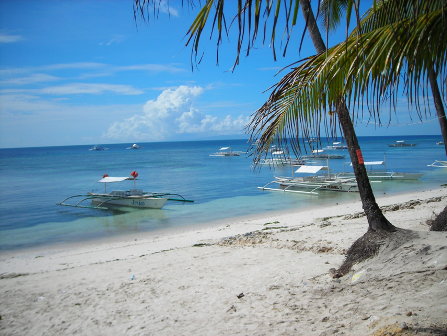 Other web sites and blogs gush about the Philippines, its people and the way of life here. I will give you a balanced, honest perspective on what it is like to retire to the Philippines, to live here, to meet people and make friends, about relationships and even marriage. I have nothing to promote, nothing to sell you. I write this blog because it is my joy and it helps me put my experiences into perspective and persistent record for any who care to read it. As I said, I have nothing to promote, nothing to sell to you but that does not mean I don't have my biases (after all, doesn't everyone?) I like it here. I love the tropics, the easy and low-cost lifestyle but I especially love the Philippine people -- the easy-going, amiable, agreeable, accepting Filipino and Filpina, or as they call themselves, the pinoys and pinays. Of course, there are challenges, huge ones and quite a few. According to Wikipedia, there are more than 250,000 Americans live in the Philippines. This number seems low to me by about 50,000 or so and the number seems to be growing daily. Some of them really like it here and adapted well while others complain of incessant boredom, the pollution, the congestion and traffic, the noise, the "anything goes" laissez-faire mentality, the whores and ladyboys, the corruption, the government -- you get the idea. The cities, especially the big ones, are incredibly crowded as compared to cities in North America and especially Europe. Even the center of small cities and towns are jam packed with people. Standing in line is de rigueur everywhere, if at the neighborhood sari-sari (convenience) stores, which are everywhere. The supermarkets (exist only in bigger cities) can be so crowded that is nearly impossible to navigate the narrow aisles with a shopping cart. Of course, the Filipinos stoically accept this as the way it was meant to be. Of course, there are uncrowded, unpolluted pristine beaches, too, like the one on the right. This picture was taken at midday in Argao, Cebu Island, Central Visayas on a beautiful day. Not a soul in sight! 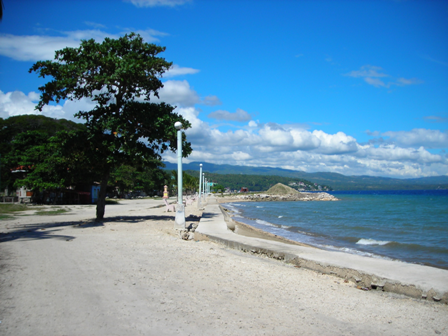 Argao is located 68 km south of Cebu City. It faces the Bohol Strait, looking across it at the island and province of Bohol. So you see, there is a balance here and trade-offs galore. I will write more about all the drawbacks I mentioned above in another post -- I don't want this to be too long and bore you to death. Look for posts about air pollution, noise pollution, corruption, traffic, personal security, scams, poverty, and the "wild east" syndrome. Other posts will be about the people, both Filipinos and American expats and my experience with each of these groups. I also hope to give you a structured geographical primer -- the most frequently asked question I get from people visiting here is "what is the best place to live or retire in the Philippines?" Other questions involve shopping: where can I get this or that. I hope to address this topic as well. Briefly, you can get pretty much anything here you can get in the US but you have to find the store, which is not an easy task. The information infrastructure is as undeveloped here as the other kinds, but I am working on changing that. I hope you enjoyed this post and if you did, I hope you will subscribe to the RSS (Real Simple Syndication) feed at the top of the page. In any case, I would love to hear from you, so by all means leave a comment. I value your feedback and impressions. Enjoy the content, your day and if you come (or if you are already here), your visit to this beautiful country of incredible contrasts and even more incredible people. Hi. I enjoyed your article and hope to read others that you have posted. I just returned from the Philippines in September. It was my third trip there but my first to Mindanao. After spending most of my time in Cagayan de Oro and ILigan, I took a 13 hour ferry ride back to Cebu and stayed there for a week exploring the area. I had been to Cebu once before and also to Bohol. I prefer the life-style on these other islands to that on Luzon. Although I have not decided if I will retire in the Philippines, I am still exploring the idea. Possibly I would think of living there three months on and three months back in the States. I am slowly making up my mind about it. I like the approach you are taking about presenting a balanced impression of expat-living in the Philippines. The people there in general are wonderful. The pollution is horrible in many places. My good pinoy friend retired there and he and his wife have a beautiful condo in Manila but are moving out after being there for one year: the pollution is so bad that he has had to suffer three attacks of bronchitis since he became a balikbayan. His waiting with "baited breath" to retire in paradise literally came true! For any "older" people, especially those with breathing disorders(COPD,etc) this must be a consideration. Life in one of the Asian cities for a person who smokes, or who recently quite smoking can be very uncomfortable and out-and-out rough on the lungs. Anyway, thanks for the comments. I am looking forward to reading more.